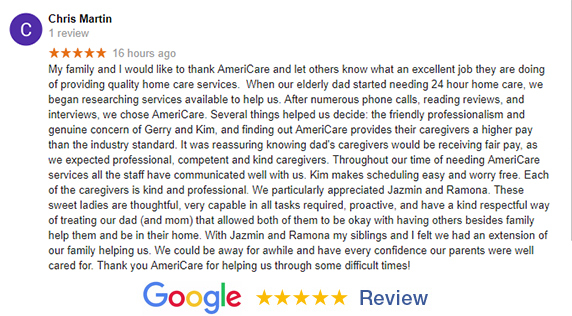 My family and I would like to thank AmeriCare and let others know what an excellent job they are doing of providing quality home care services. When our elderly dad started needing 24 hour home care, we began researching services available to help us. After numerous phone calls, reading reviews, and interviews, we chose AmeriCare. Several things helped us decide: the friendly professionalism and genuine concern of Gerry and Kim, and finding out AmeriCare provides their caregivers a higher pay than the industry standard. It was reassuring knowing dad’s caregivers would be receiving fair pay, as we expected professional, competent and kind caregivers. Throughout our time of needing AmeriCare services all the staff have communicated well with us. Kim makes scheduling easy and worry free. Each of the caregivers is kind and professional. We particularly appreciated Jazmin and Ramona. These sweet ladies are thoughtful, very capable in all tasks required, proactive, and have a kind respectful way of treating our dad (and mom) that allowed both of them to be okay with having others besides family help them and be in their home. With Jazmin and Ramona my siblings and I felt we had an extension of our family helping us. We could be away for awhile and have every confidence our parents were well cared for. Thank you AmeriCare for helping us through some difficult times! Caregivers are ready to provide the care you need. Contact us for a complimentary care consultation today!